Up until that time everything, what I did for advancement of the projects, is reflected in section”About the author”. I was bothered with that circumstance that officials in the government and in its environment have developed long-term strategy of callousness and cowardice. I was bothered with their silence and absence of any answers to my repeated references. Henceforth, all references by which I intend to do for advancement of projects, and also reaction to them officials or absence that, will be published on this page. Acquaintance with this information will allow you to analyze a situation, to draw a conclusion that occurs, why and for what. After all in such position I am not only I one, but also the majority of the formed people who have arrived on the historical native land with the unique purpose to make this earth prospering, rich and safe, for the blessing of our children. I the secular person. But something forces me to come back to the truest granted to us - to Jews Forefathers, to live, leaning against the truest stated in their wise, statements. Leaning against these truest and knowledge, with the God's help it was possible to me, it seems to come nearer in more low specified project to the answer to a question "why there comes time of building of the third Temple". If will consider its interesting, it will mean that I followed in the correct direction, conducted by force of knowledge, practice and the God's help. As a result of realization of this project, all of us, apparently, we will come nearer to this Major event in the history of the Jewish People. Yours faithfully, Yury Dedov - Goldman. 31.08.09 To Rabbi, mister Kaplun: e_kap@inter.net.il, to the editor of the religious newspaper "Shma"
After search of your phone I was sincerely glad to hear your voice! Good luck for many long years! Today I can inform you: at last, that thank God, my project has been considered in the Jerusalem house of technologies then the report with a positive response is sent in the government. But it is very interesting to me to know your opinion. And at a meeting, God will give, I will have to you some questions, as to the expert on a Torah. I am afraid that such success which will bring to us this channel, god can bring to us only. While Israel will not stop all superfluous negotiations with Arabs, and the national attention will turn round peace process with Arabs (on kind never will be), nobody will think of the new, healthy decision - the Israeli channel. Unfortunately! Zay gezunt, and god also will give to you of successes in all your good desires. The material given to you, has met with on July, 21st, 2009 approval in the Jerusalem house of technologies and, accompanied by a positive response of scientists, is sent the minister of infrastructures of Landau and the Minister for Foreign Affairs, party leader "NDI", A.Liberman with the recommendation to realization. I will be grateful, if you consider possible to publish this material. Translation from Russian on English language: With a great interest I have read articles of Jury Dedov (Goldman) - Deap Sea Captain and the economist. I very much hope that shortly, with the Divine help, its ideas will bring the big advantage to our people!!! Sergey Bargon: - constant support and desire to help with business of advancement of the project. 27.08.2009 (From earlier correspondence) Julia Tsodyks - Shtejnbok: Here after all as happens - you have infected me with the civil-engineering design of the channel. Today went to a museum of history of New York, there it is told that the channel between Hudson and lake Erie - 580 km by the way, has made the present break in the history of America. Has connected port of New York, and so Europe to the fertile earths of the Midwest and has opened the big prospects for trade. So it is possible to include this fact in your saga also. 29.09.09 Letter-gratitude to the manager of a site www.souzveteranov.com to Alex Voitsekhovsky for article about the channel and placing of a banner of a site www.isracanal.com. 30.09.09 Letter with K.Gutermana's article to an economic observer of 9th channel TV, the owner of a site www.isramir.com to Zeev Frajman with the publication request. And gratitude for the publication. 30.09.09 Letter-message on the report and recommendations of scientists from Ashdod's Houses of a Science and Technologies to Alik Soltanovich, - the deputy of the City Council of Ashkelon from party "NDI", to rabbi Moshe Livshits, to the active worker, the head of a staff "NDI" in Ashkelon - Sergey Bargon, to the active worker of party "Kadima" - Teddi Rojtih. 01.10. 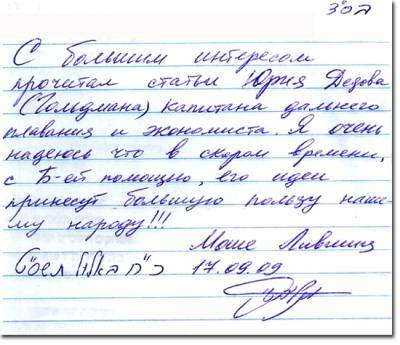 09 letter in edition of a site "Seven-forty" (the Central Jewish resource): webmaster@sem40.ru, to the Jewish organisations: office@jcm.md, chlenov@eajc.org, raskin@eajc.org, maryasis@eajc.org, Kiev_of@eajc.org, razvitie.eajc@gmail.com, anahnu2005@yahoo.com, shkolnik2002@yahoo.com, to the World congress of Russian-speaking Jewry the message on a site www.isracanal.com, to the site of the Russian-speaking Jewish organizations of Australia (menorah@list.ru) with the request to familiarize and support my site and project. 05.11.09 Telephone conversation with Daud - Liberman's assistant, under my initiative, repeated, later two weeks, after the first call. Yu.G. : - What will tell? Daud: - What I should tell? Daud: - so write the letter to its office? Yu.G: - in what office? Daud: - in office of Minister of Foreign Affairs, I'm assistant on party affairs. Yu.G: - I address to it, not as to the Minister for Foreign Affairs, and as to the party leader "NDI". Yu.G: - Daud, you should know, what at it on a table, and at minister Infrastructures Landau, for a long time "On a table" Reports of the Union of Scientists with recommendations about project start lie. I will remind that 6 years ago, you personally already called to me and informed on an appreciation Liberman of my project, and promised at once, after (those) elections, to communicate with me for the purpose of strategy development on project realization. Daud: - who has put the report "on a table" to Liberman? Daud: - I learn from Denevicha, as as. Yu. G: - Thanks, all the best! 24.11.09 Under Alik Soltanovicha's offer (the deputy of city meeting Ashkelona) I prepare the letter addressed to the Minister of infrastructures - Iosi Landau (from party "NDI") repeated, reminding of existence of the civil-engineering design of a ship canal in Israel, is enclosed to it the seminar report of Ashdod's Houses of the Science and Technologies. 25.11.09 at A.Soltanovich's meeting undertook to transfer to the minister this letter. 25.11.09 Alik Soltanovich has informed that a meeting was been and the letter is handed over minister Landau. 03.12.2009 17.00 Telephone conversation with Avram Sharnopolskim (A.S.) - The head of the Jerusalem house of a science and technology under my initiative. Yu. G - Hello Avram. Yu. G - Forgive for anxiety, but has passed a lot of time from the moment of our conversation in which you promised to me to inform if any information from the cabinet concerning project advancement "ship canal Buildings" arrives. There can be you have the nobility any news? A.S. - Unfortunately while than I can not please. Yu. G - It is a pity, well then I give you the following information: about two weeks ago we in Ashkelon had minister of infrastructures of Landau and Alik Soltanovich has transferred it my letter - a reminder on the project, with the report of session enclosed to it Ashdod's Houses of a Science and Technologies, we wait for reaction. A.S.- By the way, Jury, I too inform you that during the nearest time-1-2 of month at the ministry of infrastructures consulting council where our scientists will enter will be created, and its Alik Soltanovich, here will head and there will be at you a possibility to push and remind it about the project, practically directly. Yu. G. - The interesting information, many thanks! 17.20 Conversation from A.Soltanovichem. He has confirmed the fact of forthcoming appointment and has informed that in view of a current situation, intends to invite me to the first session of the created council and can be to charge to me to conduct a theme of advancement of the project. 05.12.2009 Answer from Avram Sharnopolski: Jury, you big well done I Wish you to punch a wall of silence and to achieve interest in advancement of your interesting project. I, from its part, will try to help you with it.